Sto's Color Lab makes the world of chroma and hue go round...including the Sto800 color collection system which is a go-to resource for those specifying color in the built environment. In a quiet, light industrial neighborhood in Rutland, Vermont, on a tree-lined street named Quality Lane, there is a lot of good color activity going on; dare we say a lot of “quality color”. This is the U.S. home for the StoColor 800 – a collection of 800 colors formulated to match the range of human visual perception. First released in 2002, this color system remains a valuable resource for those planning the use of color in architecture. But it doesn’t stop there. The Sto Color Lab turns out, on average, 70 fresh color variations and 100 samples a day. 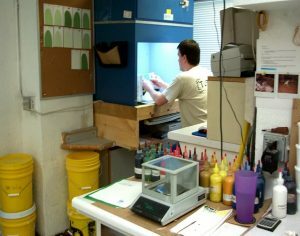 Sto’s Color Lab in Vermont is a critical component in the company’s production of superior coatings and finishes. They offer what is in effect a color customization service, responding to requests from designers, architects, contractors and applicators seeking to match a particular shade that can be derived from the StoColor 800. The Sto color formulations begin at a color computer there. A physical sample, or perhaps a color chart, is measured using a spectrophotometer. With the specific color target (standard) established, the color computer then uses previously stored colorant and product data to establish a new color formula. This initial formula is called a “starting point”. Once the color formula is approved, it is entered into the Sto color database where it “locked in” as a new standard for future use. The Sto Corp. Color Lab strives to produce the best possible match every time it develops a color formula in order to deliver ideal color representation. This means that after all the inherent variables are factored in, the final color will closely match what was ordered. This can be tricky business, because color by nature is very subjective. One person’s perfect match is another’s unacceptable hue. Everyone sees color a bit differently. Some people can have limited perception in certain color ranges; some might be completely color-blind. Color blindness, for example, is more prevalent in men than women. Color perception can also deteriorate as the lenses in our eyes begins to yellow with age. The receptors in our eyes (or rods) that distinguish light and dark are 1500 times more sensitive than the receptors for color or hue (cones). That means when comparing a sample against a standard in the Color Lab, the easiest thing to distinguish is whether it is too light or too dark. When a color matches under one light source and not another, it is a called a Metameric Match. Metamerism occurs when two objects display different spectral reflectance curves. Different spectral reflectance curves are typical when the two objects being compared have a different chemical composition, i.e. they are derived from different colorants. This means a color can look good under daylight when compared to the standard but look totally different under another light source such as fluorescents. Fortunately, Sto representatives are well-trained and well-versed in addressing these issues. 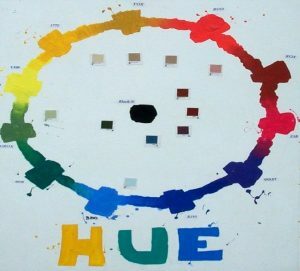 They also understand that “hue” is the color perception that allows an object to be judged red, blue, yellow, purple, and that “chroma” is an attribute of color perception that expresses the degree of departure from gray of the same lightness (sometimes referred to as saturation or density). The result is a lot of beautiful color for clients and achieving “just the right match” for the color requested. Join us next week when we visit the Sto Tint School. Sto Studio has been providing tailor-made color digital models and illustrations of design and material options for facades and interiors for over three decades now. Working closely with clients, specific architectural and aesthetic concepts are developed based on aproject’s underlying requirements, conditions and objectives. The final result is a series of color renderings to help the client determine the most appealing aesthetic choice. The following are examples of Sto Studio’s art in architecture in a range of residential and commercial projects – including both restoration and new construction. The Embassy Suites in Ft. Lauderdale was one of many Sto Studio projects for this hotel operator who is rebranding and upgrading the exterior of its properties. 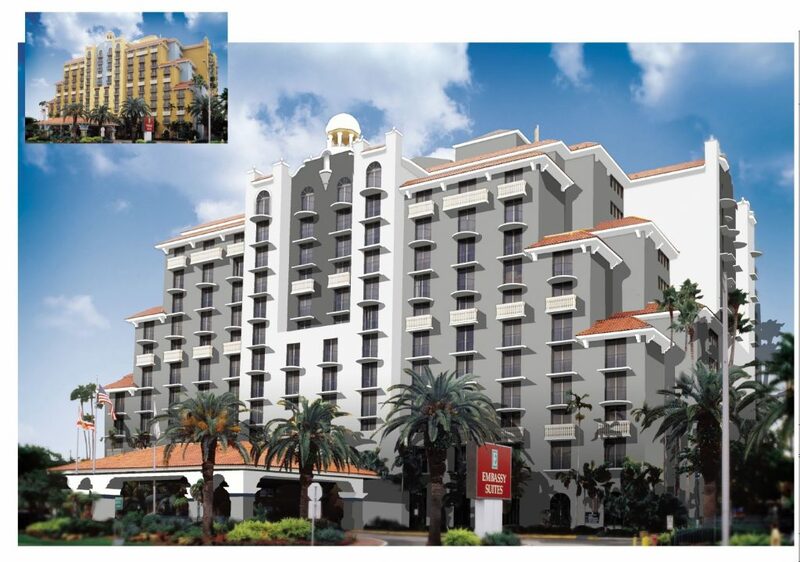 The Embassy Suites Hotel in Ft. Lauderdale, Florida was another signature Sto Studio project in the hospitality sector. Sto Studio provided a big assist with a substantial shift in the exterior color palette from a predominantly canary yellow shade to one that was more understated and elegant. 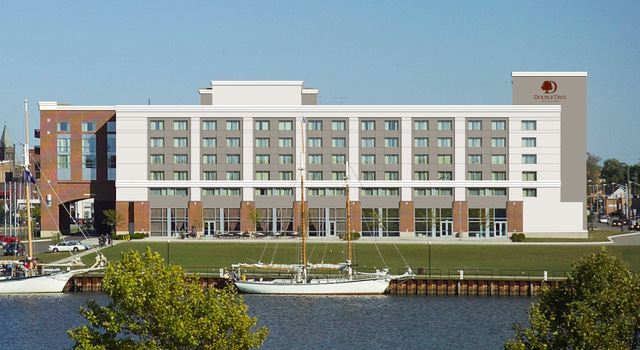 This was the fourth Embassy Suites property that Sto Studio consulted on in 2016, and more are expected as the brand continues to refine its identity. 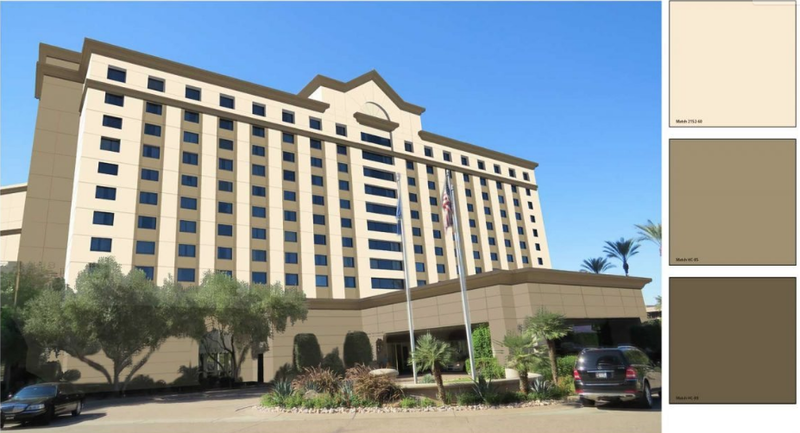 Built in 2004, this 550-room property was slated for a much-needed facelift. Sto Studio provided color and design scenarios based on a sequence of requests made by on-site personnel, the owner group, contractor and our Sto distribution partner. By offering a range of options, the eyes of decision-makers were opened to possibilities they had not previously considered, and they were ultimately able to determine the ideal solution. Seventy-thousand square feet of StoColor® Lotusan® was ultimately used to ensure optimal performance and lasting beauty. The project managers evaluated several vendors and were impressed with the alternatives presented by Sto Studio, which emphasized the contrasts between various colors. The chosen color scheme was less tone-on-tone, with a more deliberate contrast between surfaces, allowing for enhanced curb appeal and an opportunity to celebrate the building’s form. StoStudio View of a sample color scheme for the Camby Hotel in Phoenix. A single family, 6000 square foot residence in Portland, Michigan required remediation related to a failing wood-siding exterior. With local experts available to consult with the owners, a solution was quickly identified: StoQuik® Silver. To support this decision, Sto Studio was contracted to illustrate color options incorporating the existing aesthetics. Two thousand square feet of this new Sto system was installed, ensuring the ongoing comfort of the owners, and improved performance of the exterior wall. Sto Canada has been pushing the (building) envelope with Sto Panel Technology and reached out to Sto Studio to illustrate options for a new development in St. Catherines, Ontario. The project architect, Sto Panel affiliate [SkyRise], the general contractor and owner all funneled information to Sto Studio where it was distilled and cross-referenced to help generate a series of color and design renderings. Understanding the aspirations of the development team and translating that into design deliverables proved an invaluable decision-making tool. Since 1965, when Sto introduced a revolutionary color system, the company has been providing art and inspiration in architecture, working with design and building professionals to facilitate design and color decision-making. The study of color by artists, philosophers and scientists has spanned centuries, dating back to 1672 when Sir Isaac Newton defined the components of visible light as color. Segmenting the spectrum into easily identifiable color families, he led others to develop their own versions of the color wheel and established “color theory”, which in today’s parlance means “guidance on mixing colors”. While Sto Corp. doesn’t date back as far as Newton, it has been a pioneer in color theory, specifically as it relates to architecture. Product and color formulations are based on theories, old and new. In 1965, Sto introduced a revolutionary color system and has been building upon that first offering since then. The StoColor 800 — a collection of 800 colors formulated to match the range of human visual perception — was released in 2002, and remains a favorite resource for the architecture, engineering and construction sectors. Humans are able to distinguish “primary colors” (e.g. yellow, red, and blue), “secondary colors” (e.g. orange, violet, and green), which are created by mixing two primary colors (yellow + blue= green), and a host of tertiary colors for use in buildings’ interiors and exteriors. It is the human perception of color that is the foundation of the StoColor System. Sto’s color wheel is made up of 24 parent colors which are combined with white, black and grays to create a range of sophisticated colors applicable to our built environment. Extrapolating specific colors from the master palette, Sto has created subsets for varied markets: The Sto Sto Classic Color Collection, The Sto Designer Color Collection, Sto for the Southwest, The Architectural Color Collection and so on. Color is integral to our world, not just in the natural environment but also in the man-made, architectural environment. It has played a role in human evolution. Colors influence us. They affect our psychology, they communicate, inform and influence judgement. Clearly, color in architectural spaces is more than decoration. Form, function, design and color coexist within our architectural environment. Just as color plays a huge role in branding, colors define the nature and aesthetic of a building; colors help develop the culture and identity of a city as well. Architecture influences our lives more than we are usually aware and the use of color in architecture makes a built form even more impactful. 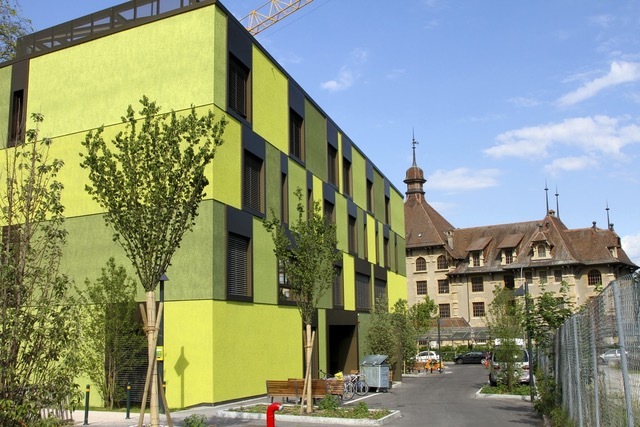 Utilizing color in buildings has evolved over the years. Grey, dull and restrained monochromatic facades — especially in older cities — have given way to bolder colors on building exteriors and interiors. Whites and greys have long been favored by architects and designers, but many feel these colors are too “grave and isolating” and are incorporating more color into their designs. Dark saturated colors are trending right now, as are so-called “celebration colors”. How uninspired is beige on beige on beige, and by contrast how delightful is it to turn a corner and see a sudden burst of color? Empirical observations and scientific studies have proven that our reactions to architectural environments are highly influenced by our sensory perception of color. Architectural psychology, color psychology, neuropsychology, visual ergonomics, psychosomatics prove that color influences us psychologically and physiologically. The psychological effects of color are the basis of what’s called visual/color ergonomics: “a multidisciplinary science concerned with understanding human visual processes and the interactions between humans and other elements of a system”. As an example of visual ergonomics: a medical facility would benefit from a different color scheme than an industrial complex or a school. As a means to help the market understand the power and potential of color Sto established Sto Studio, offering custom color solutions to clients world-wide. By illustrating the potential aesthetics for a project with full-color renderings, Sto Studio enables design and building professionals to see the future and choose from a variety of design scenarios. The team of color professionals at Sto Studio who are inspired by color and art in architecture, know the science of color mixology, but also the gestalt and psychology of color. Sto Studio designers are experts on color but also understand its value as part of new coatings and finishes, its sustainability and efficacy in meeting the goals of the design and building community, or in the restoration of protected buildings. Whether providing industry leading delivery of quality color formulas and samples, or a professional grade rendering, Sto Studio facilitates design and color decision making. The Sto Color System offers a harmonic, finely nuanced selection of colors for facade and interior use and the most advanced, visually ergonomic media presentations for all phases of color design. Chroma is the purity or intensity of a color (a high chroma has no added black, white or gray). Value refers to how light or dark a color is (the lighter the color, the higher the value). Dark colors absorb light energy and have a lower LRV (light reflective value). Light colors reflect light and have higher LRVs. LRV – Light Reflective Value: indicates how much light or energy is bouncing off a surface. A color with 87% LRV is reflecting 13% of the light energy broadcast on its surface; a dark brown with 8% LRV absorbs 92% of the light energy. Achromatic: essentially, lacking chroma (grays, neutrals, black and white). Saturation refers to how strong or weak a color is (a highly saturated color would be considered very strong). Regard it as “Pure vs. Pale”. Tones are created by adding gray to a color, making it duller or softer-looking than the original, pure hue. Tones are sometimes easier to use in designs. Shades are created by adding black to a color, making it darker than the original. The word is often incorrectly used to describe tint or tone, but technically shade only applies to hues made darker by the addition of black. Tints are created by adding white to a color, making it lighter than the original. Very light tints are sometimes called pastels, but any pure hue with white added to it is technically a tint, even if the color is still quite bright. Next week, look for Sto Studio case studies. Working with Sto Studio, building owners, design professionals, engineers and contractors can review fully illustrated aesthetic options for a project long before construction begins. Creating the aesthetic character of a building is no simple task; nor is determining the engineering and science for a structure. If you can bring these building elements together, the results are remarkable. And if you can see what it’s all going to look like before you break ground or start a restoration — not just one possible solution, but many choices — it’s magic. More importantly, it expedites informed decision-making. Working with Sto Studio, building owners, design professionals, engineers and contractors can review proposed options, which illustrate the potential aesthetics for a project long before construction begins. 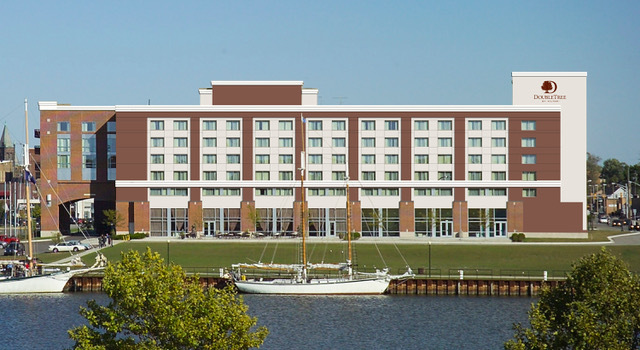 Full-color renderings offer clients the opportunity to envision the future – to really understand their structure and its appearance in a variety of design scenarios. Sto Studio is, in essence, a service that facilitates design and color decisions. Sto Studio has been providing these integrated design services for customers across the Americas, Europe and Asia for over three decades. 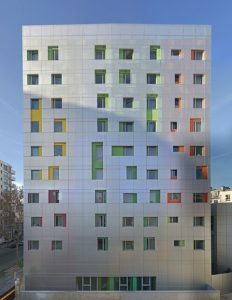 Innovative claddings and other advanced technologies are essential for both new construction and renovations today (to ensure energy efficiency and sustain the buildings’ value), but architectural treatments and color can be just as important. A commercial real estate study revealed that architectural color can increase a property value from 25-40%. 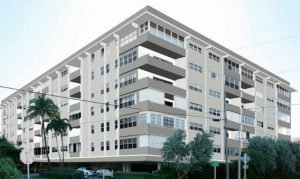 This is the StoStudio rendering for the Christopher House Project in Pompano Beach, Florida. 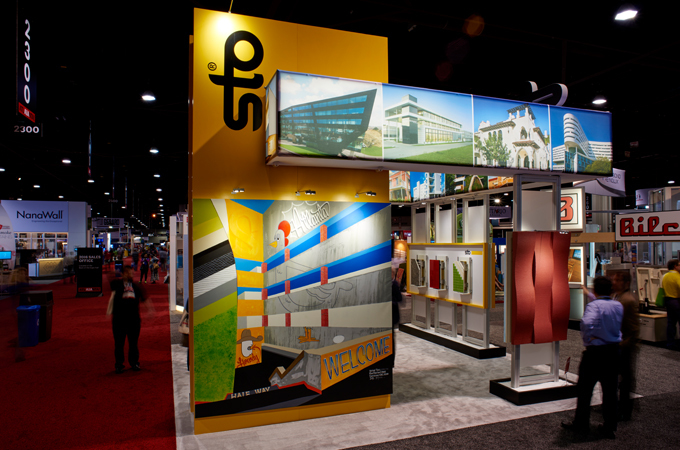 By collaborating closely with clients, Sto Studio offers a unique, value-added service, providing tailor-made color and material concepts for facades and interiors. Architectural color concepts and solutions evolve based on a project’s underlying conditions, requirements and objectives, resulting in a series of color renderings to help determine the most appealing aesthetic option. 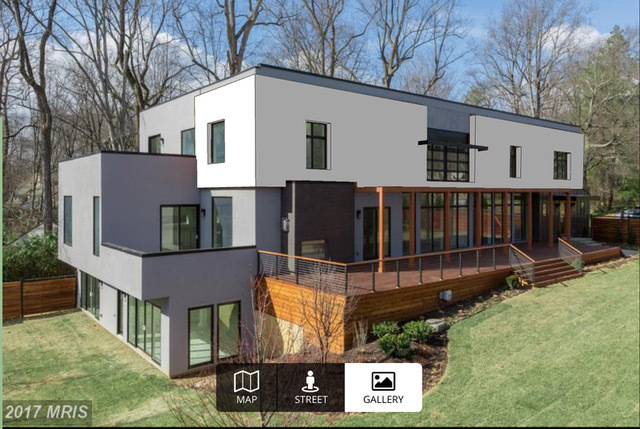 From renderings and visualizations, to color presentations and color charts, local marketing assistance, reference tools, and technical advice, Sto Studio is an essential resource for design and building professionals. The combination of technical expertise and design support often results in a holistic solution for any and all construction challenges. For instance, a bright red may be an ideal branding color for a building, but may not perform well due to it’s saturation level. It could create stress on the wall system and cause surface degradation. Therefore, art and science need to work hand-in-hand to ensure the ultimate realization of a building’s durability and curb appeal. Next Week – Color 101 – a primer on color theory and an insightful, in-depth look at the StoColor System that is an integral part of Sto Studio’s design expertise.